Production on the first Star Wars live-action streaming series has begun! After the stories of Jango and Boba Fett, another warrior emerges in the Star Wars universe. The Mandalorian is set after the fall of the Empire and before the emergence of the First Order. We follow the travails of a lone gunfighter in the outer reaches of the galaxy far from the authority of the New Republic. The series will be written and executive produced by Emmy-nominated producer and actor Jon Favreau, as previously announced, with Dave Filoni (Star Wars: The Clone Wars, Star Wars Rebels) directing the first episode. Additional episodic directors include Deborah Chow (Jessica Jones), Rick Famuyiwa (Dope), Bryce Dallas Howard (Solemates), and Taika Waititi (Thor: Ragnarok). It will be executive produced by Jon Favreau, Dave Filoni, Kathleen Kennedy, and Colin Wilson. Karen Gilchrist will serve as co-executive producer. Stay tuned to StarWars.com for updates. Very little is known yet, but we’ll keep you posted! Directly across from the chaos of the exhibit hall at Gen Con 2018 was a quiet sanctuary of pure awesomeness. The Alexandria RPG library was a room with about ten tables piled with RPG books, as well several well-stocked shelves of gaming treasures. Today we sit down with the chief librarian to learn more about this amazing find. What can you tell us about Alexandria RPG? – We are a nonprofit lending library that shares RPGs with as many people as we can via events. We also work with teens, PTSD service members, and soon senior citizens. What was the impetus for starting an RPG library? – I have been the deputy manager of gaming at Emerald City Comicon for a few years new and tossed the idea out to fill space. The manger thought it sounded fun and a few weeks before ECCC 2017 I was asked if I could still do the library. I ran out and bought some exrat books to fill in holes and add a wider variety dropping like $2000 in a couple days. Then was laid off the next month. But that first event we had like 400 books or so and people loved it. We got kids playing RPGs for the first time and had people asking if I would come to their show. Part way through that first show we got a box of donations from an old friend of mine in Iowa. He mailed them out when he heard what we we’re doing. Needless to say people loved the idea so we put our heads down and ran forward with it. We are now near 1800 books and over a 100 different systems. If you could roleplay with one historical figure, who would it be and why? -Thomas Jefferson. I figure he was super smart, self taught, and well read. I bet he had a wild imagination that he kept locked away. Do you think Andrew Johnson would cheat on his rolls? – As in the 17th President? Sure he would, he was a politician. What is your favorite book in the collection? – My first book is in the Library, my AD&D players handbook my brother and I bought at Sears in 1982. It still has the price tag on it $10.57. That book has tons of memories for me and the comic shop my family had. Which cons will you be attending in the near future? – Friday we will be at PAX West last year was huge there for us, we hosted 100 games in four days. I only brought GMs for 6. The rest we’re people that just wanted to play. How can people help Alexandria RPG? Also follow us on social media because that helps too. We have a YouTube channel and if we can get enough followers we can make a buck or two off videos there as well. Money is always needed. I have put a couple thousand dollars into the library this year and a couple of other people have as well. As a reminder we are a 501c3 and registered as a charity in Washington state. The Aliens – Lady Proxima (Linda Hunt), Moloch (Andrew Jack), and Rio Durant (Jon Favreau) look so realistic. The Shower Scene – I won’t ruin it, but it is spicy. Clone Wars – There is content from the Clone Wars cartoon included in the film. Gender Equality – Solo has several strong female roles without being heavy-handed and obvious like in the Last Jedi where every male character has to be ineffectual and useless. In Solo it is a given that men and women are equally capable of being badasses, as it should be. Cast – This movie is perfectly cast. Honestly there isn’t a bad performance. Donald Glover KILLS it as Lando, and Woody Harrelson make a great scoundrel mentor. Everyone plays their role to perfection. The Falcon – She is glorious as you knew she would be. There is no retcons to worry about, she is the YT-1300 you know and love. Chewie – Our first look at Chewie is scary. They always say Wookies are tough and violent, but you’ve never really seen it until now. The Look – The CGI is seamless. I am not a fan of CGI, but it really well done in Solo. The movie is stunning to watch. The Cameo – The keep this spoiler free, I can’t say much, but suffice it to say there is a surprise cameo that could mean big things for a future Star Wars film. It surprised the hell out of me. L3-37 – I probably am alone here, because the character was funny and well voice-acted by Phoebe Waller-Bridge, but the free-willed, sassy droid is becoming (or has already become) old hat following so closely after Rogue One’s K-2SO. If every movie has a free-willed droid, they cease to be meaningful and rare. Hell – This is a small gripe, but Han says “hell” a lot, which seems like lazy writing, there would be no hell in the Star Wars universe and the anachronism bugs me; not from any religious standpoint, just that the word wouldn’t be in their lexicon. It would be like if Lando said, what happens in Vegas, stay in Vegas. I’m having trouble finding bad things to say. It was a solid movie. I thought Solo was fun. Not as dark or serious as Rogue, but a light scoundrel adventure. It is beautiful, and perfectly cast. There are seeds for possible sequels, but the movie isn’t just a set up to something. One of the coolest games I saw at Gen Con this year wasn’t published by a major gaming company. It wasn’t even put out by an indie company; it was a homebrew game being played in the miniature games free play area. 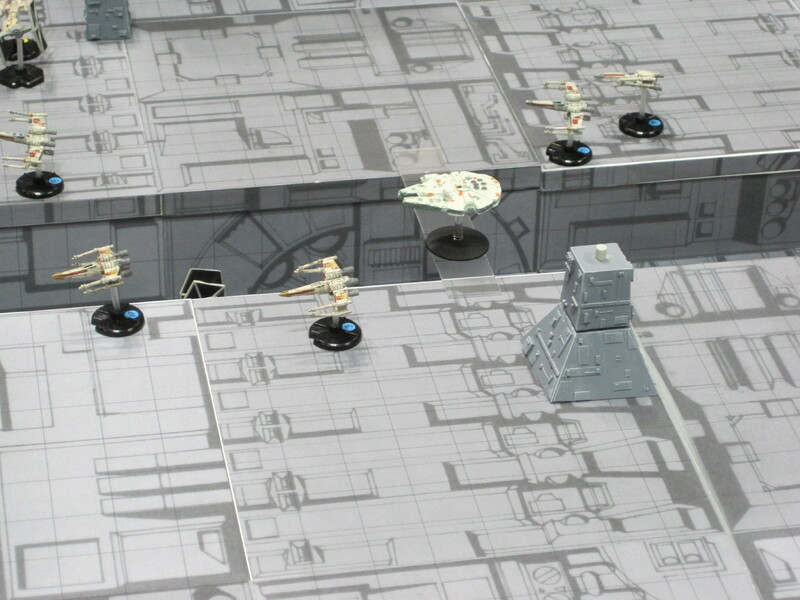 Take command of Rebel squadrons as you attempt to destroy the Empire’s powerful new weapon, or scramble TIE fighters and activate the turrets of this technological terror in order to put down the band of upstarts. 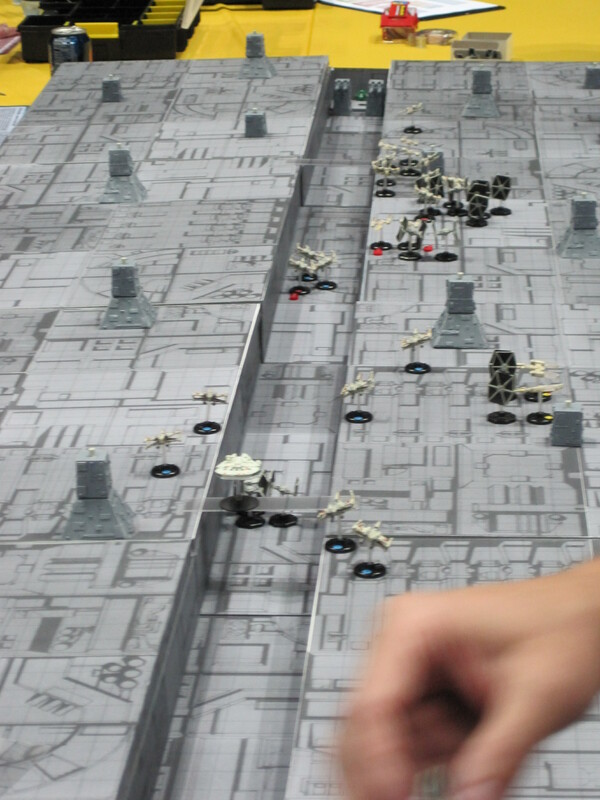 Using modified starship combat rules from the Star Wars Saga Edition RPG, two teams of players face off in this epic battle event. It is called Death Star Run Game. It is exactly what is sounds like. 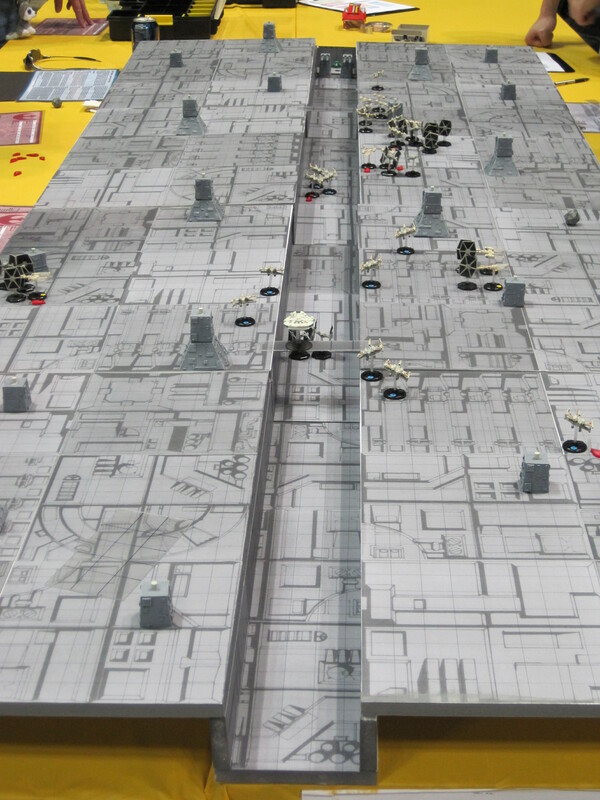 Using ships from the Star Wars Miniature game, and a homemade Death Star trench these guys have manged to create something amazing. 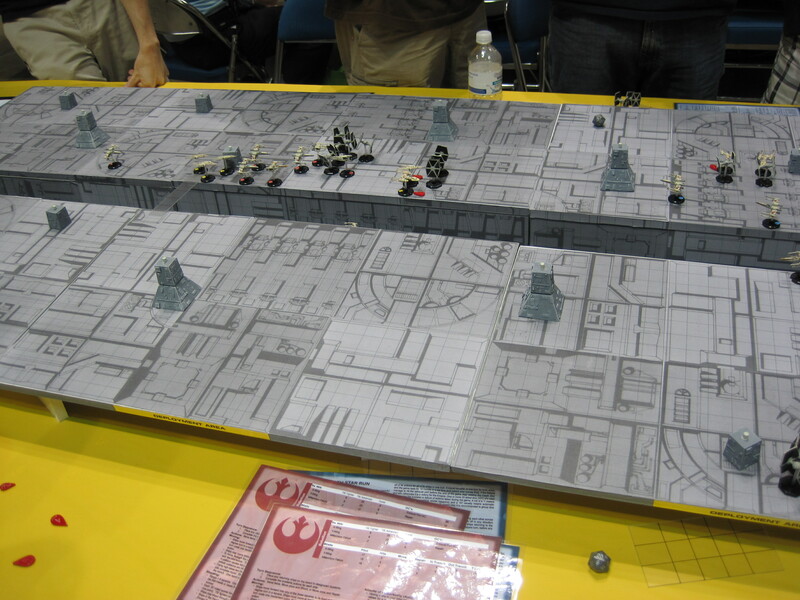 This site and its forums will help you recreate your own Death Start trench using foam core board and PDF print outs that mimic the surface of the space station. Also, they have available, simplified stat cards for the ships (one for each faction). Very cool and worth a look. Here are some shots I took at the Con, but the images on their site give a better picture of the trench.